Written in England at the end of the 13th century, this bible manuscript was owned in the 15th century by the community of English nuns of St Brigitta (or Brigittines) whose house, Syon, was originally located near Twickenham. Single volume bibles were rare in the early middle ages, but the great monasteries began to have large opulently decorated bibles made for their chapter houses by the 12th century, to show off to visitors. This bible is less impressively produced, probably having been made for theological study. It contains a 'duplex psalter' or the Book of Psalms in two Latin translations, called the Hebrew and the Gallican. After Henry VIII dissolved Syon in 1539, the Brigittines left, eventually settling in Lisbon. After the community departed England, this bible belonged to Sir Arthur D'Arcy, Lieutenant of the Tower of London, who died 1561. 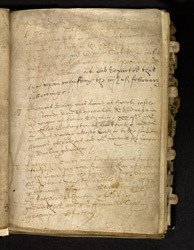 Records of births of D'Arcy children during the 16th century are recorded on this page, with names of godparents.